on the Croisette in Cannes. The Ski Club Miramar will host you in a friendly setting to discover the water sports we propose: the classical water skiing and derived gliding occupations, sailing with professionnals on the sea and parascending in secure conditions. New trend! 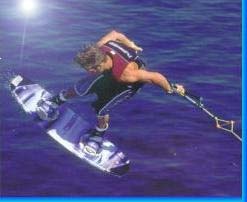 The WAKEBOARD arrived on the French Riviera and we are happy to share it with you. Come and test this new form of gliding with us. We provide training classes for beginners (adults and children) given by qualified teachers. If classical skiing is not your fun, you are invited to entertain yourself with rings, chariots, skibuses and pedalos. 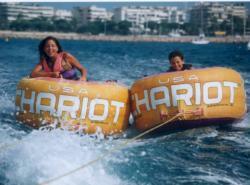 Don't stay flat on your back on the beach and come discover the most fun potentials sea provides us from age 3 to 77. For your safety and convenience three boats are available (skiing, taxi and parascending). These are Correct Craft equiped with Flight Tower Control making the most of gliding sensations. Quality equipment like Connelly, Liquid Force or Hyperlight will be available. Come for an initiation or get to more perfection while entertaining yourself. We are here to serve you.